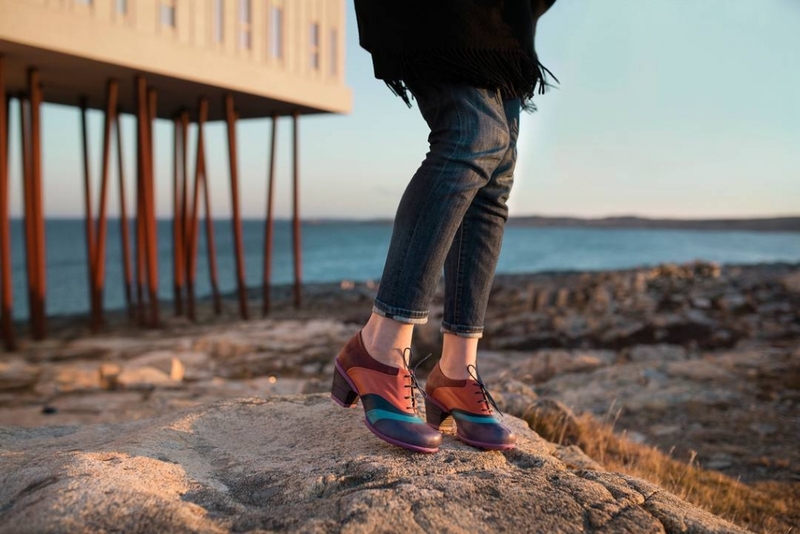 This fall, John Fluevog Shoes is delighted to be collaborating with Fogo Island Inn for the release of a limited edition shoe that will raise funds for the Shorefast Foundation, a registered Canadian charity devoted to building cultural and economic resilience on Fogo Island, Newfoundland. Designed to honour the community it will help support, The Limited Edition Vow features colours inspired by the various lichen found along the rocky shores of Fogo Island as well as a custom stamped insole. They will be available for sale online and in select Canadian and US stores with 50% of retail sales going to support the Shorefast Foundation. The shoe’s official launch party is set for Thursday, November 2nd from 7-9pm at the Fluevog Distillery store in Toronto. On top of getting first dibs on the limited edition Vows, attendees will be able to bid on one of John’s original sketches. Drinks and refreshments will also be served. RSVPs for this event are now closed. Shorefast is a registered Canadian charity that oversees three social businesses: Fogo Island Inn, Fogo Island Shop, and Fogo Island Fish. The surpluses generated by these businesses are reinvested in the Foundation to build cultural and economic resilience on Fogo Island. The Foundation supports a diverse set of charitable initiatives which include Fogo Island Arts, the New Ocean Ethic, the Shorefast Business Assistance Fund, Geology at the Edge, and various academic residencies in collaboration with Memorial University of Newfoundland.